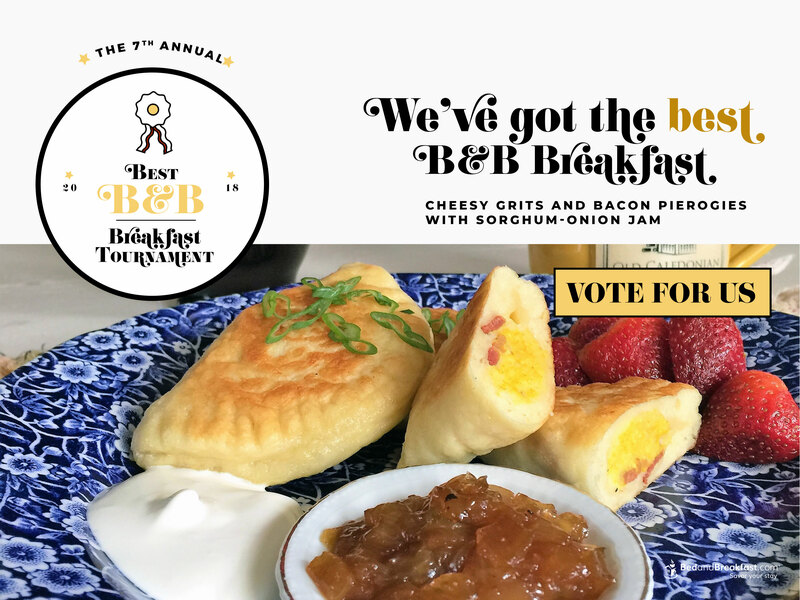 The Old Caledonian Bed & Breakfast has been selected for a spot in the sweet-sixteen for Bedandbreakfast.com’s 2018 Best B&B Breakfast Tournament! Vote for the Old Caledonian B&B! Bedandbreakfast.com’s database. The Old Caledonian’s match-up will be for one day on March 26th, and voting will occur via Bedandbreakfast.com’s website. We would love your vote, and your support by sharing this great news with your friends and encouraging them to vote for us. Thank you! The Old Caledonian’s recipe is for Cheesy Grits and Bacon Pierogies with Sorghum-Onion Jam. A pierogi is a dough-wrapped dumpling normally filled with mashed potatoes. We thought that if dough could be filled with mashed potatoes, it could surely be filled with cheese grits (Jon likes cheese grits better than mashed potatoes, anyway). Sorghum is a Missouri local favorite, and who doesn’t like bacon? We think this recipe has something for everybody, and it tastes SO GOOD! To vote for the Old Caledonian B&B’s recipe head to here on March 26th. Thanks for your support! In other happenings, things are really greening up here in Caledonia. The grass is up in our 4-acre backyard, the hyancinths and daffodils are blooming, and the herb garden is already starting to produce! April 14th: Historic Caledonia Scavenger Hunt! Get your teams together and have fun at this brand-new community event. Thank you again for your vote, and see you soon in Caledonia!